All flowers are beautiful and appropriate for giving anytime. But, certain flowers are standouts for November. They offer a look that’s perfect for fall and a sense of warmth to convey just the right message during the holiday season. Snapdragons come in bold yellow and orange, and in visually stimulating white. They have long, dramatic stems and have a bit of a scent but not one that’s overpowering. These flowers represent graciousness and strength. They’re perfect for giving in a tall vase or paper wrap. You’ll find calla lilies in warm, subdued hues like cream and peach, and in soft yellow. These unscented flowers are bulbs, so you can give the blossom or be creative and opt for a collection of bulbs for the recipient to plant later. 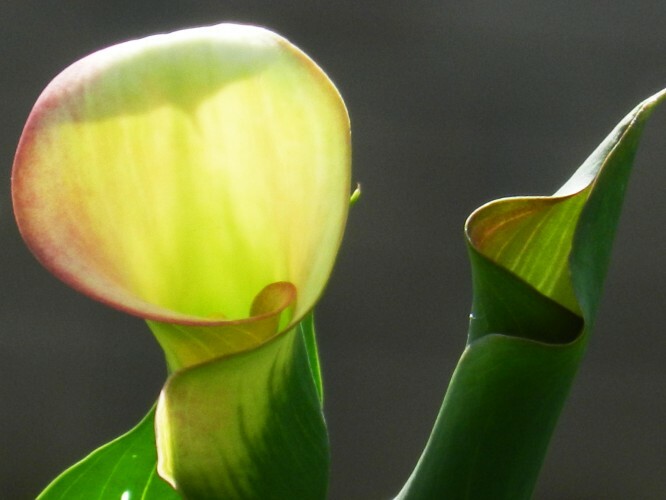 Calla lilies stand for beauty. They’re pretty in bouquets and look gorgeous when surrounded by greenery. If you want to give a flower that will welcome winter, choose stephanotis. It looks like a 5-pointed star and it’s a luminous white with a vibrant fragrance. Stephanotis is also called Madagascar jasmine and it is said to bring harmony into a space. Iris comes in many hues, but for November, consider yellow and purple. Some irises have a sweet scent and others barely show off a fragrance. They all represent faith and hope. The word “iris” is derived from the Greek goddess of rainbows. As the name suggests, grape hyacinth looks like a small bunch of grapes. It’s stunning paired with larger, showier flowers. Also called muscari, this flower is striking in purple and even more glorious in white. You can get sweet-smelling grape hyacinth in green too. Do you love giving any other flowers in November? If so, we’d love to hear which are your favorites. All flowers are beautiful and appropriate for giving anytime. But, certain flowers are standouts for November. They offer a look that's perfect for fall and a sense of warmth to convey just the right message during the holiday season.